Sparky arrived on Monday 1st May 2017. Went to his new home on Monday 8th May 2017. 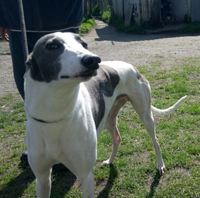 Sparky is a white and blue male greyhound who was born in September 2013, he weighs 31.3 kg. and his inoculations are up to date. From what we've been told he's okay on the lead, travels well in a car, ignores other breeds of dogs when out walking, is okay with children and loves attention.